We all dream of beautiful nurseries when expecting a baby. 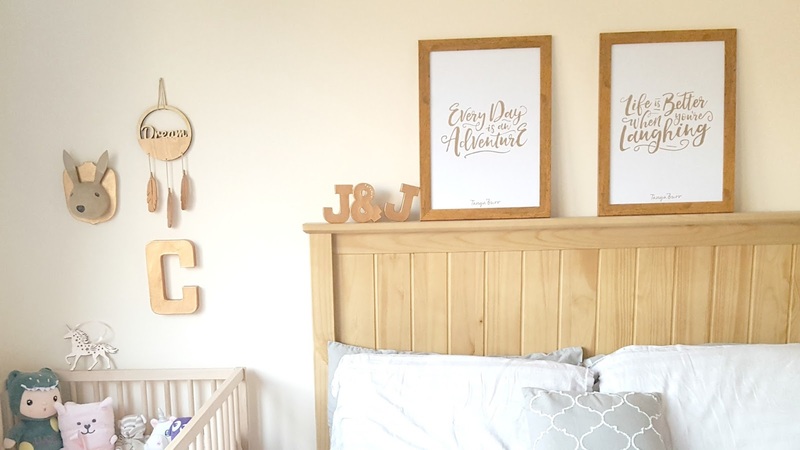 A special space just for your bundle of joy complete with matching furniture sets and personalisation. 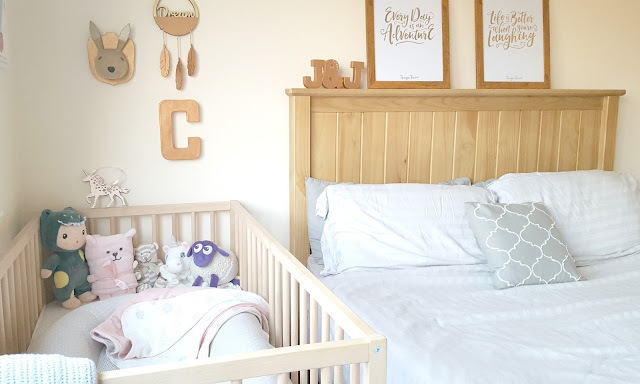 However when it came to fitting a new baby into our 2 bedroom semi we knew a nursery wasn't an option and she would have to share with Ted at some point. For the first 6 months however she would need to be in our room and needed somewhere to sleep. 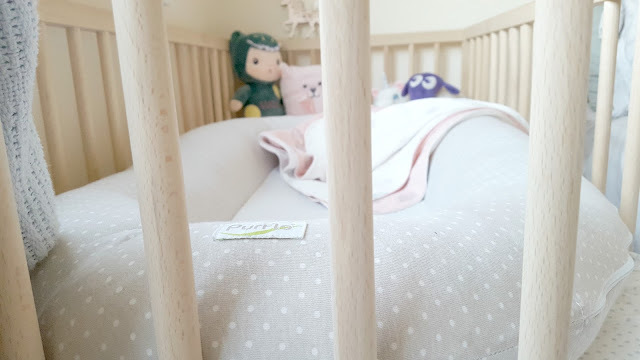 We then planned that baby would be in her full sized cot from the beginning, sleeping in a little Puflo Bednest for added comfort and to make her cot seem less daunting for those early days. We had Joe's cot from when he was a baby for Ted but it was quite a large cot and just wouldn't have fitted in our room. With that we got hunting for a cot to fit in the corner of our room and I got my thinking cap on to design the perfect corner for little one. 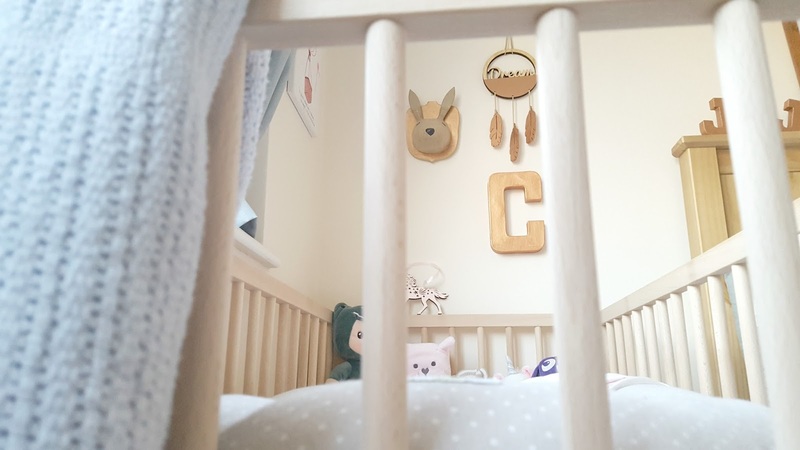 We didn't have a huge budget so when I saw a lovely cot in Ikea for just £39 I was instantly drawn to it. 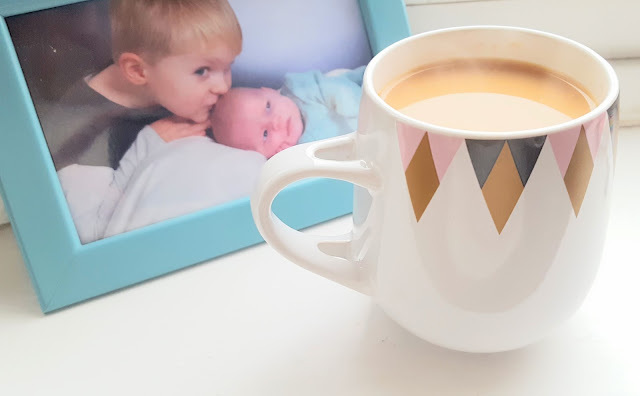 When I saw it in store it was perfect, very simple but well made and just what we needed for our small room. 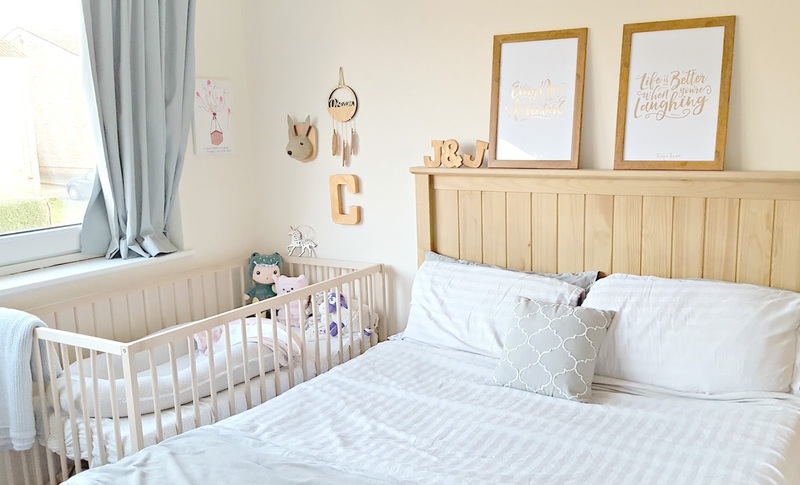 All the cots in Mothercare etc were huge and would not have fitted down the side of our bed just as Joe's old one wouldn't. So that was the cot sorted and the mattress from Ikea was just as reasonable. I wanted to go for grey, pink and copper as that is how we have decorated our bedroom and it may sound silly but I wanted it to fit in with our room. 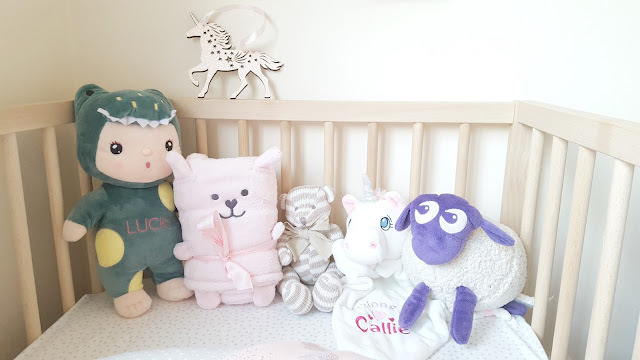 I got some lovely cot sheets from George at Asda with clouds and polka dots on and had our favourite My 1st Years blanket that I knew would work really well too. They don't actually sell the sheets I got anymore but here are some cute elephant ones. Wanting to add a bit of copper in I popped down to Hobbycraft and picked up a super cute decoupage base which is a mounted rabbits head. A blank canvas ready to add my own sparkle too and also got a letter C as we already had her name locked in a few months before she was born! I dug out my old trusty copper acrylic paint and got to work painting them. The paint was from The Works and was about £2 a tube. I used it for our wedding decor as well and still have a lot left so it really goes a long way. I also found a gorgeous wooden dream catcher in Primark for I think £3 and that just completed the wall art. A few hooks in the wall and a couple of command strips and that was the decor done. I had lots of boxes from Callie's baby shower too which I filled with any bits we wouldn't need right away and popped them under her bed. We have a large drawer under our bed too which is full of her clothes and she even has some of my wardrobe space...babies really do take over don't they?! I really love her little corner and although she is next to the window we are able to keep her warm enough and she isn't really moving much yet to faff about with the curtains although give her time I am sure that will change! 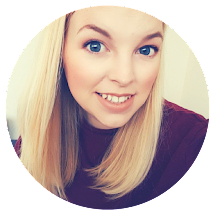 She should be going in with Ted at about 6 months so a new post will be up then showing how we transform his room into a room for a 4 year old and a 6 month old. Eek time flies! I can do a post about the rest of our bedroom if that is something you guys are interested in, just let me know in the comments. What a gorgeous corner in your room! I love the little touches on the wall, so sweet!